Mar 22 – St Nicholas Owen, SJ, (d. 1606) – Martyr, Artist, Builder of Hiding Places for Priests | ADULT CATECHESIS & CHRISTIAN RELIGIOUS LITERACY IN THE ROMAN CATHOLIC TRADITION: hosting ONLY True Christians!! !, or "How to think Catholic!!" 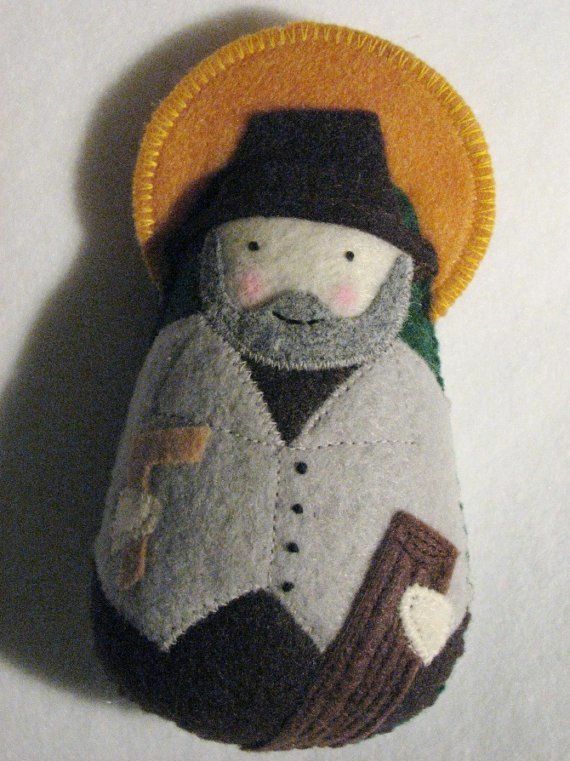 Nicholas, familiarly known as “Little John,” was small in stature but big in the esteem of his fellow Jesuits. Born at Oxford, this humble artisan saved the lives of many priests and laypersons in England during the penal times (1559-1829), when a series of statutes punished Catholics for the practice of their faith. Over a period of about 20 years he used his skills to build secret hiding places for priests throughout the country. His work, which he did completely by himself as both architect and builder, was so good that time and time again priests in hiding were undetected by raiding parties. He was a genius at finding, and creating, places of safety: subterranean passages, small spaces between walls, impenetrable recesses. At one point he was even able to mastermind the escape of two Jesuits from the Tower of London. 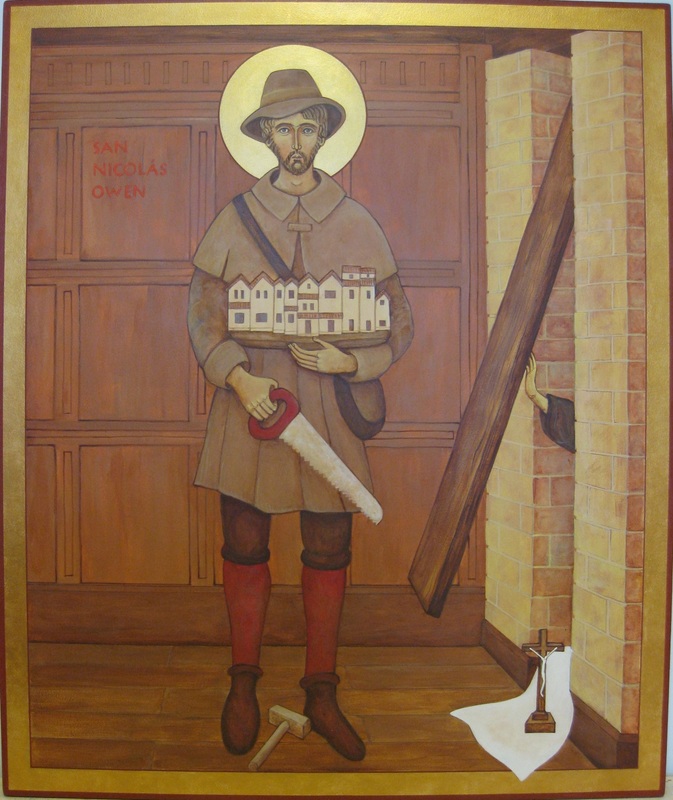 Whenever Nicholas set out to design such hiding places, he began by receiving the Holy Eucharist, and he would turn to God in prayer throughout the long, dangerous construction process. Nicholas enrolled as an apprentice to the Oxford joiner William Conway on the feast of the Purification of Blessed Mary, February 2nd, 1577. He was bound in indenture and as an apprentice for a period of eight years and the papers of indenture state that he was the son of Walter Owen, citizen of Oxford, carpenter. Oxford at the time was strongly Catholic. The Statute of artificers determined that sons should follow the profession into which they were born. If he completed his apprenticeship it would have been in 1585. We know from Fr. 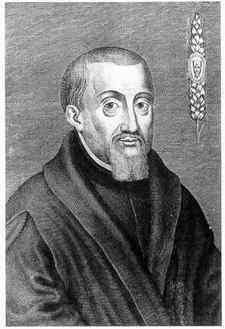 John Gerard, SJ, a biographer of Nicholas’, that he began building hides in 1588 and continued over a period of eighteen years when he could have been earning good money satisfying the contemporary demand for well-made solid furniture. St Henry Garnet, SJ, Jesuit Superior in England at the time, in a letter dated 1596 writes of a carpenter of singular faithfulness and skill who has traveled through almost the entire kingdom and, without charge, has made for Catholic priests hiding places where they might shelter the fury of heretical searchers. If money is offered him by way of payment he gives it to his two brothers; one of them is a priest, the other a layman in prison for his faith. Owen was only slightly taller than a dwarf, and suffered from a hernia caused by a horse falling on him some years earlier. Nevertheless, his work often involved breaking through thick stonework; and to minimize the likelihood of betrayal he often worked at night, and always alone. The number of hiding-places he constructed will never be known. Due to the ingenuity of his craftsmanship, some may still be undiscovered. After many years at his unusual task, he entered the Society of Jesus and served as a lay brother, although—for very good reasons—his connection with the Jesuits was kept secret. After a number of narrow escapes, he himself was finally caught in 1594. Despite protracted torture, he refused to disclose the names of other Catholics. After being released following the payment of a ransom, “Little John” went back to his work. He was arrested again in 1606. This time he was subjected to horrible tortures, suffering an agonizing death. The jailers tried suggesting that he had confessed and committed suicide, but his heroism and sufferings soon were widely known. Why should priests need hiding places? From 1585 it was considered treason, punishable by a traitor’s death, to be found in England if a priest had been ordained abroad. Of Owen, the modern edition of Butler’s Lives of the Saints says: “Perhaps no single person contributed more to the preservation of Catholic religion in England in penal times”. The Gunpowder Plot of 1605, in earlier centuries often called the Gunpowder Treason Plot or the Jesuit Treason, was a failed assassination attempt against King James I of England and VI of Scotland by a group of provincial English Catholics led by Robert Catesby. The last hope for the Catholics collapsed when peace was made with Spain. They had hoped that Catholic Spain, as part of the bargain, would have secured freedom for them to practice their religion. Relief of Catholics was discussed, but James said that his Protestant subjects wouldn’t stand for it. So there was to be no relief. In fact the screw was tightened again. Anglican bishops were ordered to excommunicate Catholics who would not attend Anglican services – this meant that no sale or purchase by them was valid, no property could be passed on by deed or by will. The level of persecution was higher than ever it had been under Elizabeth. In the aftermath of the Gunpowder Plot, 1605, the result of the frustration of a group of young Catholics when, after dropping hints of toleration, James I made it clear that there would be no relaxation of anti – Catholic legislation, the hunt for priests accused of complicity centered on Hindlip House. This had been provided with hiding places by Nicholas Owen which proved undetectable. He himself was there and when he emerged after four days of hiding he was arrested. At daybreak on Monday, 20th November, 1605, Hindlip House was surrounded by 100 men. They began to rip the house to pieces. In the dark, early on Thursday morning, two men, Owen and Bl Ralph Ashley, SJ, another lay-brother and cook, were spotted stealing along a gallery. They said they were no longer able to conceal themselves, having had but one apple between them for four days. They would not give their names. It was hardly likely that Nicholas Owen, of all people, would not have been better provided. They had twice been tipped off during the previous week that a search was imminent. Possibly they hoped that in giving themselves up they would distract attention from the two priests still in hiding, Fr Garnet, SJ, and Fr Oldcorne, SJ, still hiding in Hindlip House, even to being mistaken for them. It was a ruse that had worked before. It didn’t work now. The search was intensified. The priests were in a hide which had been supplied with a feeding tube from an adjoining bedroom, but the hiding place had not been designed to be lived in for a week. After 8 days they emerged, were arrested and identified. All four were taken to London. On March 2nd it was announced that Nicholas Owen had committed suicide. People were simply incredulous. It would have been impossible for one who had been tortured as he had. The Venetian Ambassador reported home: “Public opinion holds that Owen died of the tortures inflicted on him, which were so severe that they deprived him not only of his strength but of the power to move any part of his body”. It seems certain that the suicide story was a fiction concocted by a Government deeply embarrassed to find itself with a corpse in its custody as a result of torture. For those few grim days in February, writes a historian, as the Government tried to break him, the fate of almost every English Catholic lay in Owen’s hands. In life he had saved them, in death he would too: not a single name escaped him. In opposition to English law, which forbade the torture of a man suffering from a hernia, as he was, he was racked day after day, six hours at a time. He died under torture without betraying any secret – and he knew enough to bring down the entire network of covert Catholics in England. The trick was the prolonged use of the manacles, an exquisitely horrible torture for one of Owen’s ruptured state. He was originally held in the milder prison of the Marshalsea, where it was hoped that other priests would try to contact him, but Little John was ‘too wise to give any advantage’ and spent his time safely and silently at prayer. In the Tower he was brought to make two confessions on 26 February and 1 March. In the first one, he denied more or less everything. By the time of the second confession, long and ghastly sessions in the manacles produced some results (his physical condition may be judged by the fact that his stomach had to be bound together with an iron plate, and even that was not very effective for long). 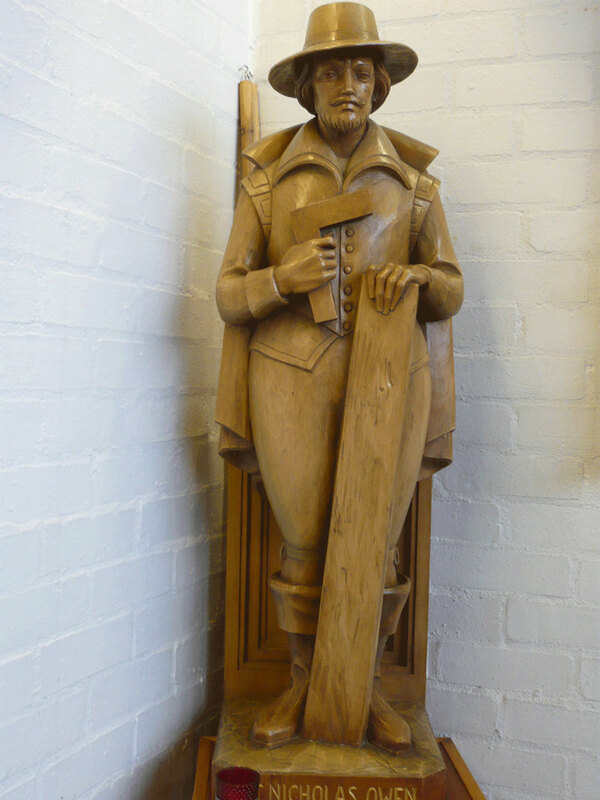 Little John admitted to attending Father Garnet at White Webbs and elsewhere, that he had been at Coughton during All Saints visit, and other details of his service and itinerary. However, all of this was known already. Little John never gave up one single detail of the hiding places he had spent his adult life constructing for the safety of his co-religionists. The lay brother died early in the morning of 2 March. He died directly as a result of his ordeal and in horrible, lingering circumstances. By popular standards of his day, this was a stage of cruelty too far. The government acknowledged this in its own way by putting out the story that Owen had ripped himself open with the knife given him to eat his meat – while his keeper was conveniently looking elsewhere – rather than face renewed bouts of torture. Yet Owen’s keeper had told a relative who wanted Owen to make a list of his needs that his prisoner’s hands were so useless that he could not even feed himself, let alone write. 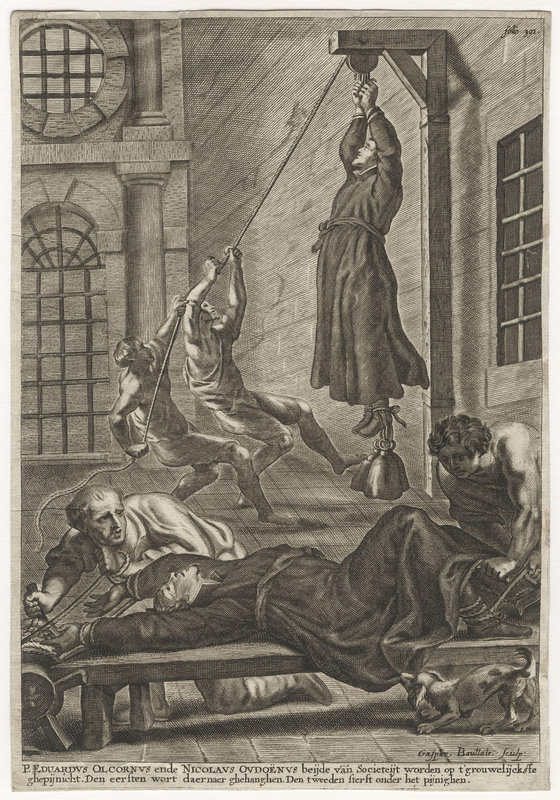 -engraving, “Torture of Blessed Edward Oldcorne, SJ & St Nicholas Owen, SJ, by Gaspar Bouttats, National Portrait Gallery, London. 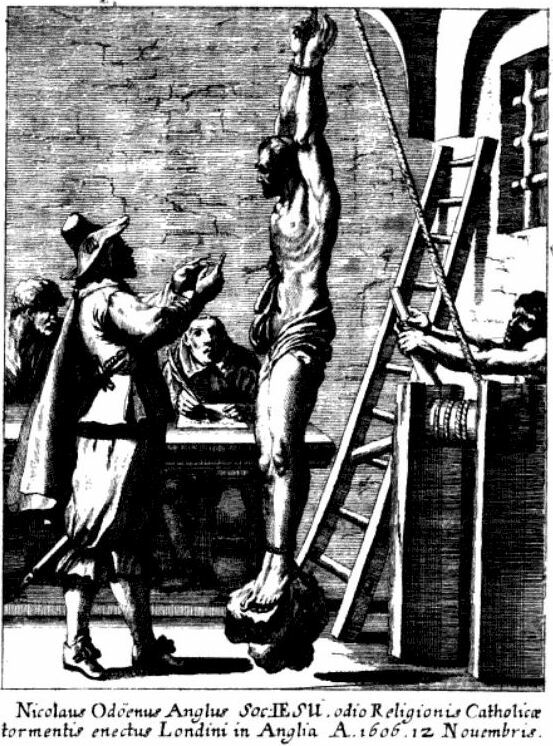 The Jesuit hanging from his wrists with weights tied to his feet is suffering the “Topcliffe rack”. This method of torture was ultimately what killed Nicholas Owen, as due to his hernia, “his bowels gushed out with his life”. Catholic stage magicians who practice Gospel Magic, a performance type promoting Christian values and morals, consider St. Nicholas Owen the Patron of Illusionists and Escapologists due to his facility at using “trompe l’oeil”, “to deceive the eye”, when creating his hideouts and the fact that he engineered an escape from the Tower of London. Many Catholic builders, if they are familiar with him, may say a prayer of intercession to St Nicholas Owen prior to beginning a new project. –from the Homily of Pope Paul VI at the canonization of Forty Martyrs of England and Wales, including St. Nicholas Owen, SJ, 25 October 1970.